Tagaytay City is one of the most popular tourist destinations in the country. It is well-known for its majestic view of the Taal Volcano and Taal Lake plus its relaxing mountain breeze. Though the city has evolved over the years, it retains a charming and relaxing vibe that has captured the hearts of both its dwellers and vacationers. People often find comfort in Tagaytay’s tight-knit culture, evident in the overall warmth of the communities. Guests and residents alike revel in cozy dining options offered in family houses that have been converted to private restaurants. Being part of this inviting community is possible in Serin East Tagaytay, Avida Land’s latest residential development amidst the beautiful Tagaytay City. The development stands on a quiet location that gives its residents the privilege to enjoy a new side of Tagaytay as a contemporary haven with a laidback feel. Serin East Tagaytay stands out as the ideal vacation home as it reflects the timeless allure of the city while blending the comforts of modern lifestyle. This countryside haven will rise along the diversion road connecting Aguinaldo Highway and the Tagaytay-Nasugbu Highway. It is strategically located within close proximity to the city, and actually serves as a gateway to other travel destinations such as Batangas, Cavite and Laguna. People were given a taste of the delightful living experience that Serin East Tagaytay offers during its launch held at the Avida Showroom in Glorietta, Makati City. 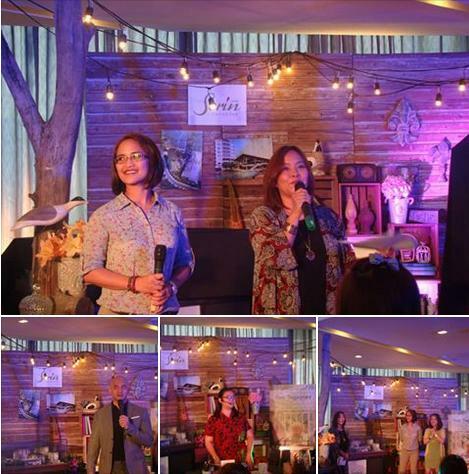 Avida partnered with tastemakers of bespoke furnishings - Joel Salazar and Paul Baez of Lucina Home, and Kristine Neri-Magturo and Mike Magturo of Urban Abode for the launch, to exude the Tagaytay lifestyle offered in Serin East Tagaytay. In order to help its future residents make the most of Tagaytay living, Avida Land also came out with the second issue of Stay Tagaytay magazine in partnership with Good Housekeeping on discovering the dream life at Serin East Tagaytay. “The dream life usually happens after retirement…but Avida is making this attainable even for younger families through affordable home options in picturesque locations such as Tagaytay. You may just find that your favorite weekend getaway can turn into a permanent address,” said Good Housekeeping Editor-in-Chief Tisha Alvarez-Angluben. Bursting with abundant greenery, wide open spaces and modern features, Serin East is a refreshing getaway to come home to for those who need a relaxing living experience. Its clubhouse is surrounded by manicured lawns and pocket gardens inspire both fitness and reflection. Idle days can also be spent lounging by Serin East’s resort-type dipping pool.